Bascinet of the XIV century is a replica of a real-life medieval head armor, which you may see on the numerous medieval miniatures. Battle helms of type bascinet appeared in medieval Europe in the XIV century and gained great popularity among knights of all military branches. Originally, bascinet (or bastsinet) was worn under the Great Helm (or Topfhelm). Such battle armor was a good protection during a Cavalry attacks with a lance atilt. Bascinet, or rather its earlier version – cervelliere – had been worn under the main helm. In time, steel cap transformed into bascinet with full dome and visor. This early visorless model has nasal plate attached to the dome with hinge, and does not protect face completely.  Therefore, it’s better to use such functional helmet together with mail coif or aventail. You may also like these models of the XIV century bascinets: bascinet with side hinged visor, bascinet helmet without a visor. Morion is a Renaissance helmet. 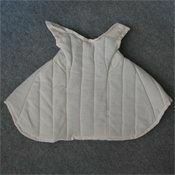 Typical features are high comb and wide brims curved up from the front and back. This knight armor appeared in Spain in the early XVI century. Mostly lance knight wore morion and in time, this late helm became an armour element of palace guard. 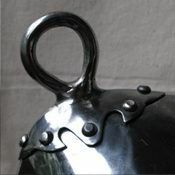 Morion was also used by sellswords landsknechts. 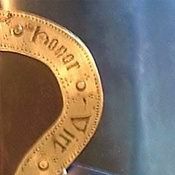 There were two way of morion making: whole-hammered of one piece of metal and decorated with ornamental etching (more expensive models) and morions made of several pieces of metal. This custom-made head armor may be completed with bar grill or meshed visor for face protection. 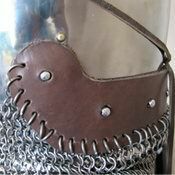 You can use this functional German helmet for: SCA HEMA Larp Stage performances Medieval festivals Reenactment events &nbs..
Norman (Nasal) helmet is a type of early medieval conical combat helmet. You may see it on the Bayeux Tapestry. It appeared in the IX century and was in use until the XIII century. 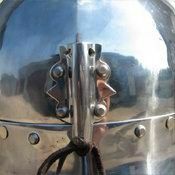 Typical feature of this head armor is a long nose-guard plate, attached to the dome and partially protected a face of warrior. Usually, nasal helmets were completed with mail aventail for face, neck and chest protection. Conical helmet has an installed bar-grill visor and back neck plates. Distance between the rods of visor is about 2 cm (less than 1 inch) that completely corresponds to SCA-standards. You can use this authentic combat helmet for: SCA HEMA Larp Stage performances Medieval festivals Reenactment events Main photo shows functional head armour with following options: Cold-rolled steel 1.5 mm; Satin polishing as finish treatment; Steel rivets; Sewn liner; Steel nickel-plated buckles; Black leather belts; Steel vervelles for aventail; Mail aventail Base price includes following option..